Generally speaking, we’re not the kind of people that line up for restaurants anymore… if we do, it better be darn good. And if you see us lining up for dim sum, it probably means we woke up late (after all, there are tons of places to have dim sum and we prefer eating early to avoid the rush). I’ve been hearing about Chef Tony for some time and figured that we’d hit the place when they first open and shouldn’t have a problem getting a table. We were surprised that there was already a lineup when we arrived and the place wasn’t even open yet. Fortunately, we were ushered in once they opened and had no trouble getting a table for two. But it did fill up very quickly afterwards. The interior has kind of a modern/futuristic decor vibe going on (and supposedly, they have 4 separate VIP rooms). Their menu has a number of items with interesting twists to them. First up was the Black Truffle, Pork, Shrimp Dumplings. 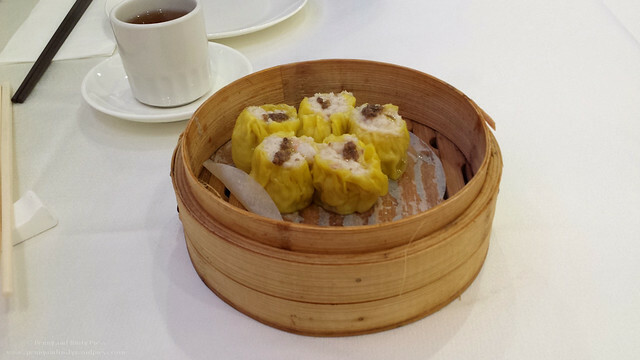 Outwardly, they appear to be like siu mai but these little bundles of joy were so much better. The black truffle imparted a very fragrant punch and the filling was super juicy on the inside. While these dumplings were on the small side, they were sooo good! 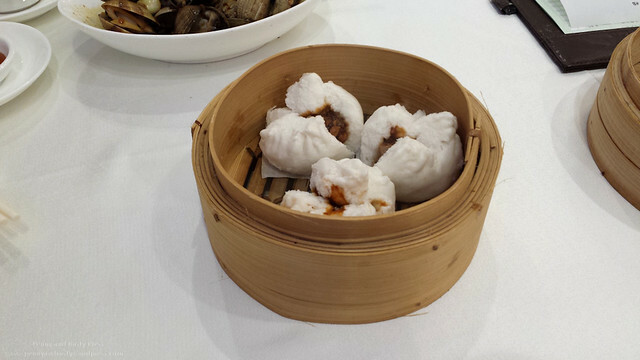 Meanwhile, I thought the small BBQ Pork Buns, while pillowy soft, were a tad too dry. 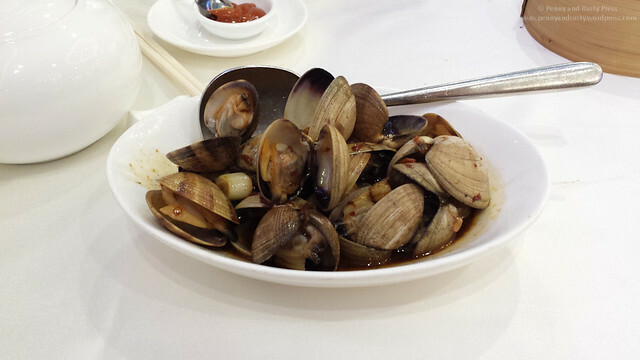 The Yi Dong Special Spicy Clams were a bit spicy and had plenty of large, plump clam meat. Eggplant is one of those dishes that is either hit-or-miss. 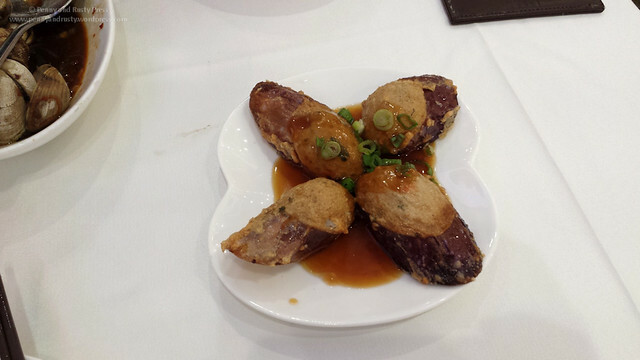 Fortunately, the Eggplant Stuffed with Fish Paste in Abalone Sauce here was the best of our dim sum meal. The eggplant was perfectly tender and not stringy or mushy. Like the BBQ Pork Buns, I found that the Steamed Sliced Beef Omasum (stomach) to be just average. We decided to try something new to use to mix things up and went for the Bitter Gourd and Chicken Shred Rice Noodles. 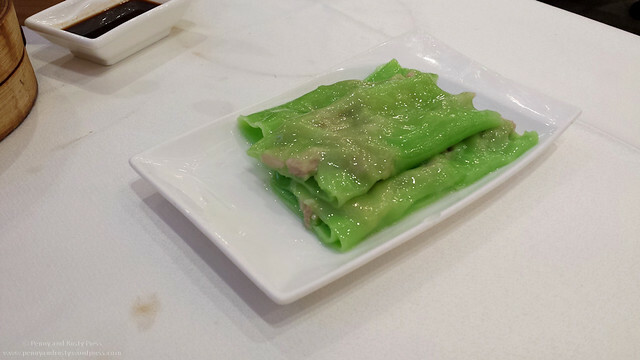 I thought the shiny green sheen of the rice rolls was interesting. Fortunately, there was only a hint of bitter aftertaste from the bitter melon. The strands of shredded chicken in the filling, however, was difficult to break up and I think this dish would have paired better with minced beef. 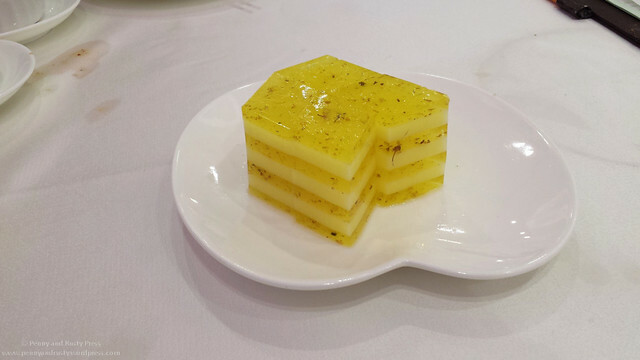 For dessert, we ordered the Chilled Osmanthus Jelly. I really enjoyed this dessert even though it was difficult to pick up with chopsticks. Overall, some interesting dishes and some that were quite well prepared. On the other hand, not all of the dishes warrant the price and line up so you have to be deliberate with your menu selection. 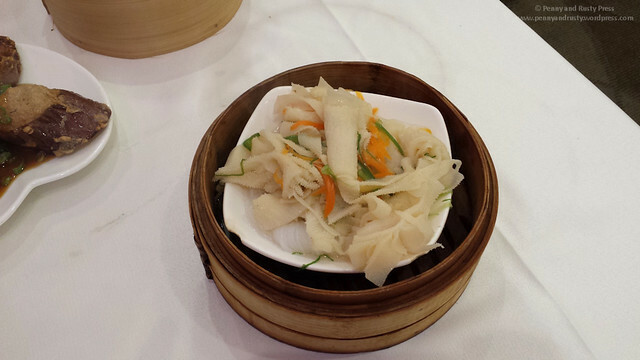 Posted on November 27, 2015, in Chinese, Dim Sum, Restaurant Review and tagged Bitter Melon, Central Richmond, Chilled Osmanthus Jelly, Chinese, Clams, Dim Sum, Food, restaurant review, Richmond, Steamed BBQ Pork Buns, Stuffed Eggplant. Bookmark the permalink. 3 Comments.